James Bond – MI6 agent codename '007' – is driving from Lake Como to Siena, Italy, with the captured Mr. White in the boot of his car. After evading pursuers, Bond and M interrogate White regarding his organisation, Quantum. M's bodyguard, Mitchell, a double agent, attacks M, enabling White to escape; Bond chases Mitchell and kills him. Bond and M return to London and search Mitchell's flat, discovering through tagged banknotes that Mitchell had a contact in Haiti. Bond tracks the contact, Edmund Slate, and learns that Slate is a hitman sent to kill Camille Montes at the behest of her lover, environmentalist Dominic Greene. While observing her subsequent meeting with Greene, Bond learns that Greene is helping an exiled Bolivian General, Medrano — who murdered Camille's family — to overthrow his government in exchange for a seemingly barren piece of desert. After rescuing Camille from Medrano, Bond follows Greene to a performance of Tosca in Bregenz, Austria. En route, the CIA head of the South American section, Gregg Beam, strikes a non-interference deal with Greene to maintain access to assumed stocks of Bolivian oil. 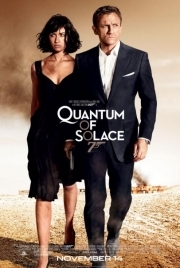 Bond infiltrates Quantum's meeting at the opera, and a gunfight ensues. 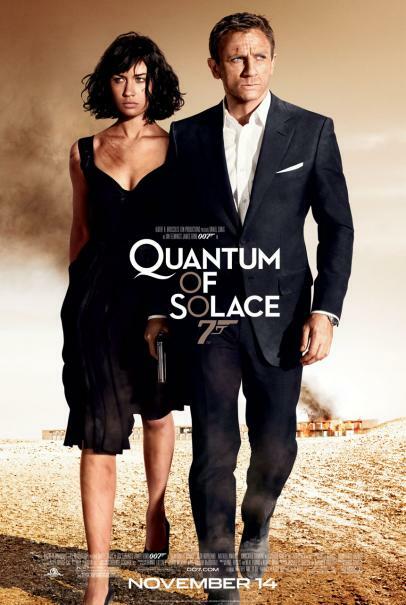 A Special Branch bodyguard of Quantum member Guy Haines, an advisor to the British Prime Minister, is killed, and M – assuming Bond is the killer – has his passports and credit cards revoked. Bond convinces his old ally René Mathis to accompany him to Bolivia. At the La Paz airport, they are greeted by Strawberry Fields, an MI6 officer, who demands that Bond return to the UK immediately; nonetheless, Bond soon seduces her before they attend a party Greene holds that night. At the party, Bond again rescues Camille from Greene. Leaving, Bond and Camille are pulled over by Bolivian police working for Medrano. They had earlier attacked Mathis and put him in the boot of Bond's car to frame Bond; and, in the ensuing struggle, Mathis is killed. The following day, Bond and Camille survey Quantum's intended land acquisition by air; their plane is shot down after a brief air battle and they skydive out of the burning plane into a sinkhole. In the cave, Bond and Camille discover Quantum are damming Bolivia's supply of fresh water to create a monopoly. Back in La Paz, Bond meets M and learns that Quantum murdered Fields by drowning her in crude oil. M orders Bond arrested for disobeying orders but he escapes. He risks capture by doubling back to tell M that Fields demonstrated bravery in the field, and this is enough to convince M that Bond can be trusted. Bond meets with Leiter, who discloses Greene and Medrano will meet in the Atacama Desert to finalise the coup. Warned by Leiter, he evades the CIA's Special Activities Division when they attempt to kill him. At the hotel, Greene and Medrano negotiate their terms. Greene then finally reveals his true plans: now that he controls the majority of Bolivia's water supply, Greene forces Medrano to accept a new contract that makes Greene Planet Bolivia's sole water utility company at significantly higher rates. Bond infiltrates the hotel, kills the Chief of Police for betraying Mathis, and confronts Greene. The hotel is destroyed during the ensuing struggle; Camille kills Medrano, avenging the murders of her parents and sister, and Bond captures Greene. After interrogating him about Quantum, Bond leaves Greene stranded in the middle of the desert with only a can of motor oil. Bond and Camille kiss before they part. Bond travels to Kazan, Russia, where he finds Vesper Lynd's former lover, Yusef Kabira, with a new target, a Canadian agent. Yusef is a member of Quantum who seduces women with valuable connections. Bond decides not to kill Yusef and allows MI6 to arrest him. Outside, M tells Bond that Greene was found in the middle of the desert dead, with two bullets in the back of his skull and motor oil in his stomach; Bond denies knowing anything. M also reveals that Leiter has been promoted and has taken Beam's place. She reinstates Bond as an agent; he tells M that he never left. As he leaves, he drops Vesper's necklace in the snow. Whole or part of the information contained in this card come from the Wikipedia article "007 Quantum of Solace", licensed under CC-BY-SA full list of contributors here.